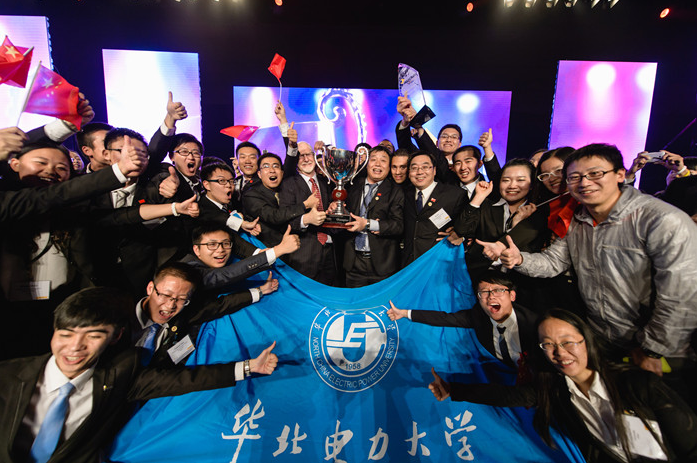 On October 24, 2014, at the 14thEnactusWorld Cup Final with the most and largest participants, competitors from NCEPU lifted the trophy of global championship of Enactus World Cup high. The public welfare project that was planned and operated by university students themselves shocked and moved the world. The Enactus Group of Our University with an average age of 20 received the highest honor given by Enactus Global CEO LuoAiwenin the blessing and cheers. 34 countries such as Britain, the United States, Egypt and Russia were involved in the competition. The groups from these countries were national champion teams standing out from many selection procedures. 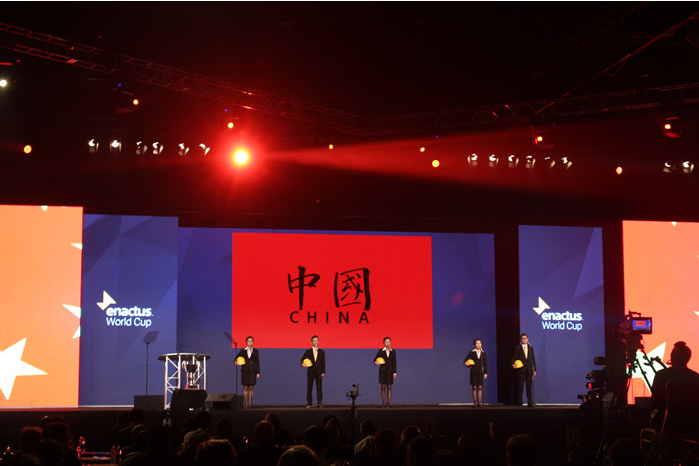 This World Cup totally attracted 749 business representatives and 3411 student representatives, which recorded the largest number of participants and spectators over the previous Enactus World Cup. The public welfare project of “Green Power” of Enactus Group in our university aims at helping poor families in Inner Mongolian pastoral areaonly having two hours lighting electricity every day to get green, reliable and safe electricity for living and production. In the vast Inner Mongolian grassland, the herdsmen depended on kerosene lamp and burning cow dumps or sheep droppingsto heat and light in the past, which not only caused serious pollution to environment but also had enormous security hidden danger. Besides, no electricity seriously affected the local education, medical treatment, and employment level. The wind-solar complementary generation system self-developedby Enactus Group of Our University solved some problems such as low power efficiency and short service life of the equipment caused by bad weather, which improved the income and living standard of local herdsmen.It was estimated that the amount of power available of daily usage increased to 6 KWH from 0.18 KWH, which increased 40-fold. The herdsmen could have access to not only some basic life electrical appliances such as electric lights, television, telephone,refrigerator, and so on, which improved their living qualities, but also some production equipment such as electric shearing machine, water pump, chaff cutter, and so on, which improved production efficiency, reduced labor intensity, more important, the survival rate of the lamb, saved the feed costs and helped herdsmen double their incomes. On the afternoon of October 23, the brilliant and passionate exposition made byEnactus Group of Our University stated clearly the general situation of the project over the past three years. The rigorous defense deepened judges and audience’s understanding of the project and made them re-comprehend the meaning of “Green Power” project. The excellent performancereceived a commendation from the judges. And our group stood out from world top groups such as the Netherlands, Morocco and Russia and successfully reached the last 16 of the world cup. On the morning of October 24, the drums of semifinals were sounded. The EnactusGroup of our university competed against Britain, Egypt and Kenya. Their performance was still excellent and won much applause for their brilliant statement. Finally, they reached into the last four of the world cup. 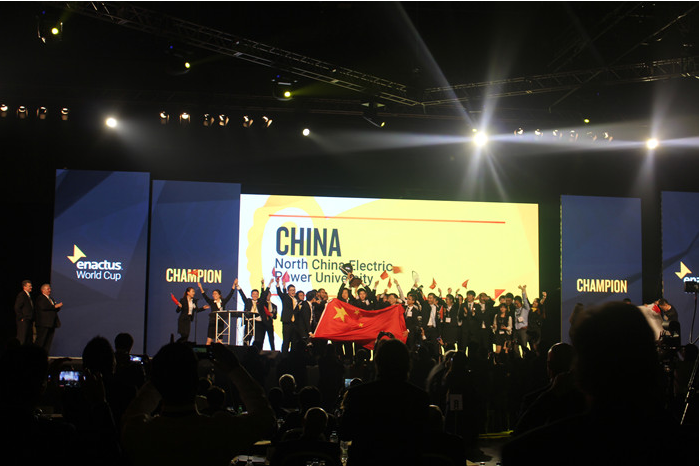 The final competition was played among China, Ireland, Puerto Rico and Monaco. All participating teams did all they could in the final. “I was born in the vast prairie ofInner Mongolia. My dream is to bring happiness and good future to Inner Mongolian people. I got a chance to meet the Enactus in my university, and I told them my dream. Finally, we decided to work together for this dream.After four years’ generous pay and three generations marching forward bravely fearlessness of hardship, now the apparently penniless people in the past are living abundant life, which demonstrated not only the changes of people’s life, but also the society recognition for our hard work. In the future, we will get to more areas without electricity in Inner Mongolia grassland and try to light them.” the project leader Zhang Haoqian’s presentation with deep feeling deeply moved all the judges. At last, the Enactus Group of Our University won the championship with their excellent performance.